What's Really Going On In Greece: Cooking in the eye of the storm! When I started this blog I spoke to several of my Greek friends here and explained what I was trying to achieve … they were all very kind and supported me. I asked them if they would be good enough, at some point, to cook a few Greek dishes for me to photograph and put up on the blog. They all agreed and disappeared off into the sunset. A couple of days later I got a phone call inviting me to one of their houses where they were going to cook a recipe for me … great I thought, thank you and I’ll be there! So the next day off I went … thinking that there would be just a couple of ladies cooking a recipe, that I would then photograph … oh how wrong I was, the truth is that I should have known better! I arrived at the house and was greeted by a friend and her cousin, this is great I thought as I sat down to have a chat, the next thing I know the door bell goes and in comes her Mum and Dad, Dad armed with huge bags of vegetables - as if he had gone mad at the market - but It wasn’t the market which he had gone mad at, it was in fact his garden! We are at the time of year where gardens are spewing vegetables out faster than even the most starving of African nations could possibly imagine or hope to keep up with. With the vegetables now inspected and accepted by his daughter and niece he disappeared off into the house to find the grand children to whom he delivered a rather large bag of sweeties, a few seconds later and accompanied by lots of delighted shrieking he resurfaced for some coffee and settled down on the sofa to watch the new Prime Minister being sworn into government. In the mean time Mum, who I later dubbed ‘the hurricane’, had set down her bags and pots of flour and cheese, I didn’t actually have a second to take this in because the next thing I knew the door bell was ringing again - making the sound of a deranged bird which was tired of having its tail pulled every ten seconds. In walks another friend along with her two children and equally as laden with bags. Here we go I thought. What happened next took nothing short of an air traffic controller to orchestrate. Not only were there at least nine people in and around the kitchen BUT I was told that we were to make four recipes simultaneously…. If I am entirely honest it took the best part of everything that I had to keep up with the four ladies who, thanks to years of training, had developed the most amazing ability to create food on scales I have not seen for years, I must confess to asking if the rest of Greece would be joining us for our snacks afterwards. 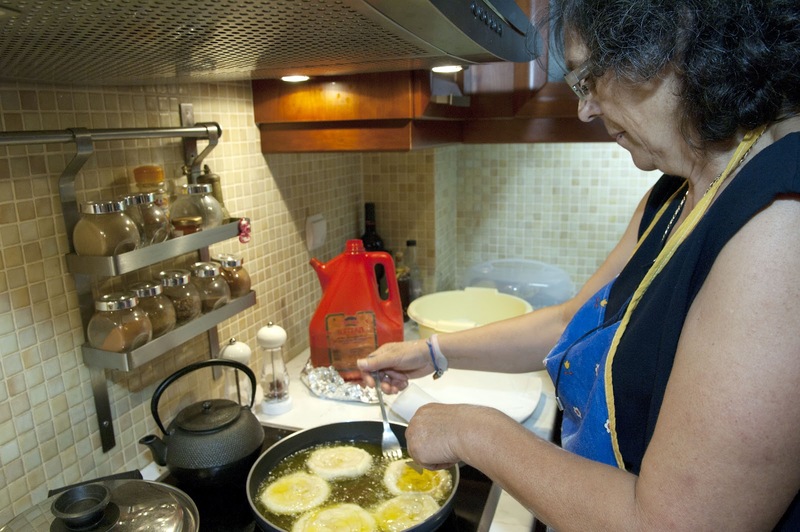 Greek kitchens suffer from or are ruled by hierarchy, it is a matriarchal society which you must wait years to lead. ‘The hurricane’ - who got her name that night due to the fact that everything she did was done so fast that the 3 second delay on my extended flash seemed like a life time. Consequently I was in a permanent sate of frenzy trying to catch the movement I wanted before the moment was gone! ‘The hurricane’ was in control, it wasn’t her kitchen but that didn’t seem to matter and everyone was happy to accept these rules. She was amazing, never have I seen hands move so fast. Once I had my pictures I had to stand back in awe of the remarkable lady and the speed at which she worked, this was the speed in which she demanded that everyone else work at too! While ‘the hurricane’ was busy with her side of things the cousin started concocting a separate recipe ‘zuccini balls’ which left me dancing between the two recipes and, if that was not bad enough, no sooner was there space on the work surface the friend started with her creation ‘cheese pies’ and just as I thought we were getting to a level of calm, my host’s husband walked in completely over loaded with bags of tomatoes and fruit – so much so that I genuinely thought the kitchen might implode. From in amongst the fruit he handed his wife a bag of snails from his Mother. His Mother had collected them and fed them flour for ten days so that they were now ready to cook and eat, needless to say the snails were now fair game and my camera was back in over drive! The evening was great fun and extremely interesting despite the fact that there were so many things going on in a relatively confined space. I was amazed to see that in spite of this, everyone seemed to work their way around one another and not only that but by some sort of a miracle everything was ready at the same time! To simplify things and so that you are not confused I have decided to break the evening down into separate postings so that you have some kind of a chance of getting it right! With respect to ‘the hurricane’ I shall start with her recipe. This recipe with these quantities will make between 60/70 rolls. You should halve or quarter the quantities depending on the number of mouths you are feeding!! The good news is that they freeze extremely well. extra olive oil for brushing and for frying. Firstly, if you are not scaling down the recipe then you’re going to need a very large bowl. Pour the glass of olive oil into the bowl then add the flour, salt and raki, mix these together with your hands and slowly add in the water, you may need slightly more or less water so go slowly! Once everything has mixed and you have a large mound of dough you’re going to need to start dividing the dough into small balls of dough these should be about the size of a table tennis ball. Spread out a pile of flour on a table and flatten the balls out so that they are now about 5mm thick and disc shaped. Now there are two ways of doing the next part. If you have a pasta roller then you should now feed the dough into the machine twice to flatten it out. Run a fair few through at a time. Next, you need to reset the pasta machine so that the rollers are closer together making the dough even thinner … you need to end up with long strips of dough around 1 mm thick. 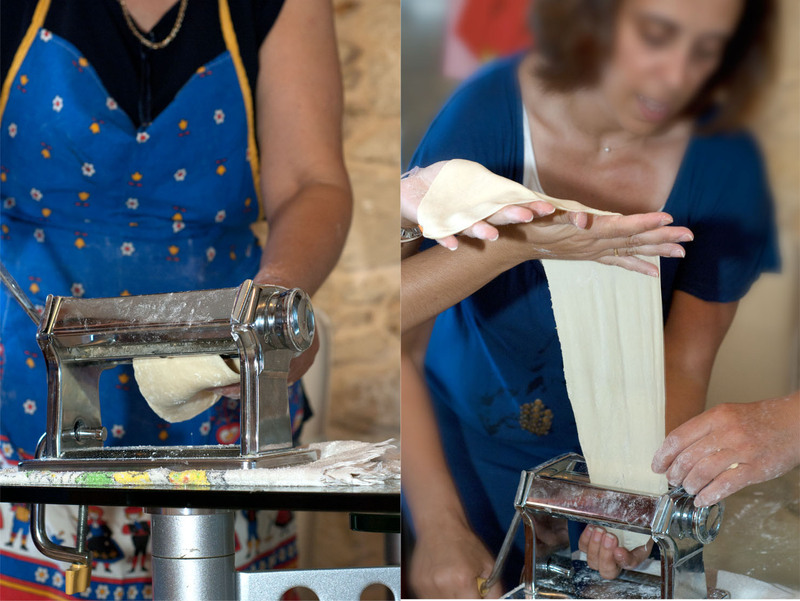 If you do not have a pasta machine then all this can be achieved with a rolling pin. Take the strip of dough and lie it out on the table. Paint a strip of olive oil down the center and then lightly spread out some of the cheese. 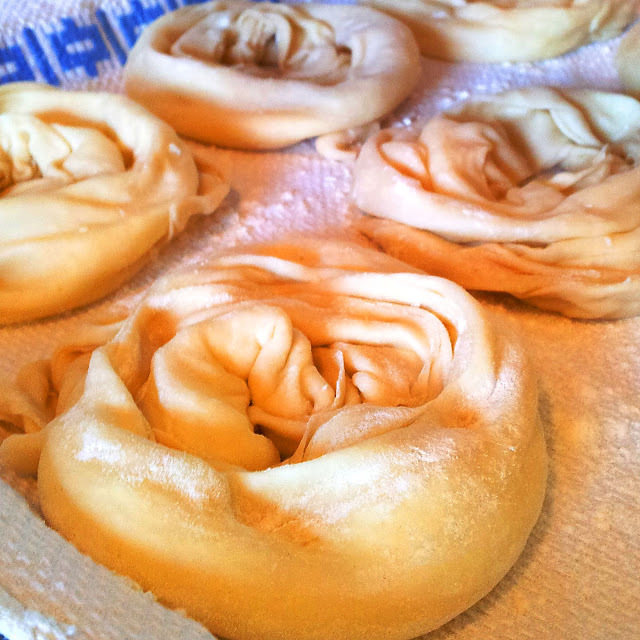 Fold the sides over one another and roll it around itself. Place the finished rolls on a tray and put a tea towel over the top while you repeat the process. At this point you can freeze the cheese pies, they will keep for about 6 months in the freezer. Frying – we use olive oil here, just because we have so much of it, but you can use any kind of oil that you like – you need a large frying pan -put about 1.5 cm of oil in the bottom and turn the heat right up. 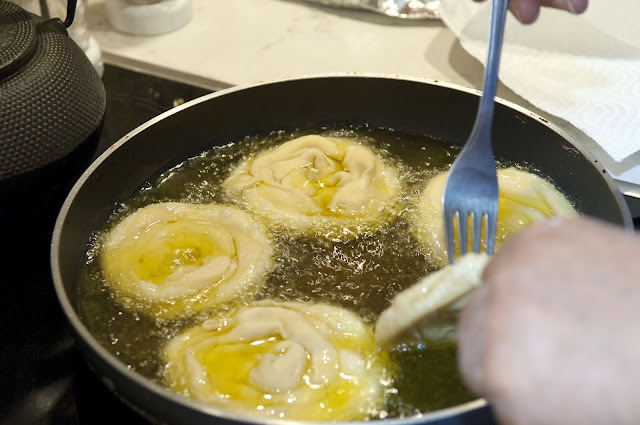 Once the oil is hot but not burning you can start frying, put a few of the cheese rolls into the pan and fry them lightly, after about 1 – 2 mins turn them over and fry the other side. 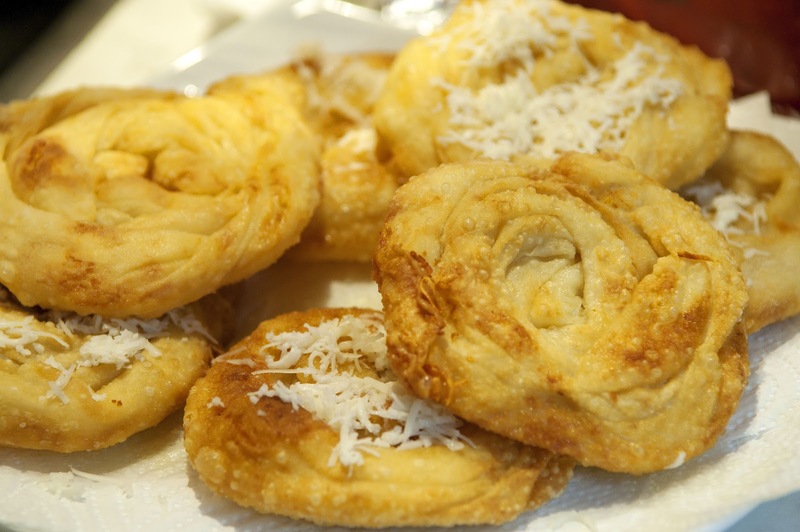 When you take them out they should be golden, put them on a plate which has some kitchen paper on it to absorb the excess oil then sprinkle a little cheese on top of the rolls. It is best to serve these hot as a snack but you can also have them the next day with a little honey for breakfast.